On the 27th of February 2017 the Russian satellite ranging system «Sazhen-TM+OWS» was officially opened at the Hartebeesthoek Radio Astronomy Observatory (HartRAO). The opening was led by Dr. Thomas Auf der Heyde of the Department of Science and Technology and Mr. Sergey Saveliev of the Russian State Space Corporation «Roscosmos». Among the guests were officials from JC «RPC «PSI» (the contractor responsible for the production and installation), HartRAO, the DST (SA), the NRF, as well as the Deputy Head of the Mission of the Russian Embassy in South Africa. Top: Group photo of Russian and South African delegates attending the opening function. 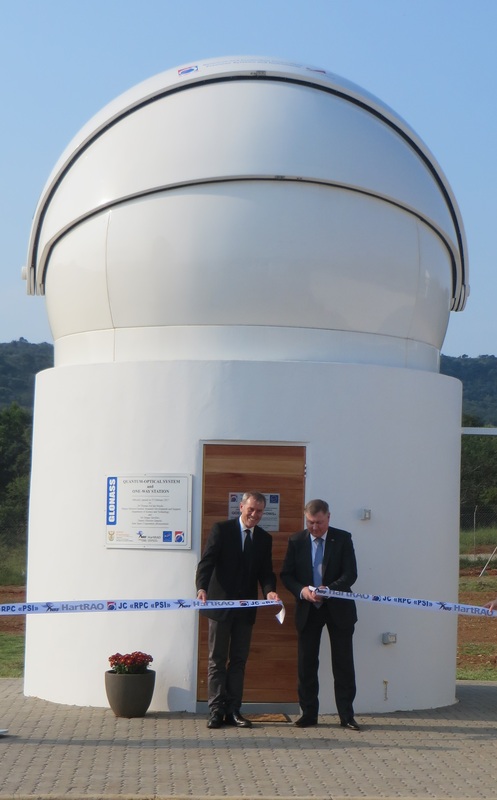 Left: Ribbon cutting by Dr Thomas Auf der Heyde, Deputy Director-General: Research Development and Support, Department of Science and Technology and Mr Sergey Saveliev, Deputy Director General, State Space Corporation «Roscosmos». The system «Sazhen-TM+OWS» installed in South Africa has become the second laser and radio ranging system of the foreign segment of the «Roscosmos» network of stations developed in support of GLONASS (the Russian GLObal NAvigation Satellite System). The first «Sazhen-TM+OWS» system was commissioned on 14 July 2014 in the city of Brasilia, Brazil. This system is designed to perform precision orbital measurements of spacecraft – those equipped with laser retro-reflectors. The system can range to satellites with an orbital altitude of up to 25 000 km, do continuous tracking of navigation signals of the GLONASS and GPS satellites, perform measurement of the current navigation parameters and receive navigation messages transmitted from the satellites.